This looks like a case for the ... Impartial Mediator! It's a fiendish plot straight out of the pages of Action Comics. One massive corporation's attempts to capitalize on the popularity of a member of the organization is thwarted by the legal action of another massive corporation. Okay, so it's more of a plot out of an inellectual property law textbook and wouldn't look all that great if it were drawn by the finest artists in the world. But it still involves Kryptonite. And Krypto-Nate. 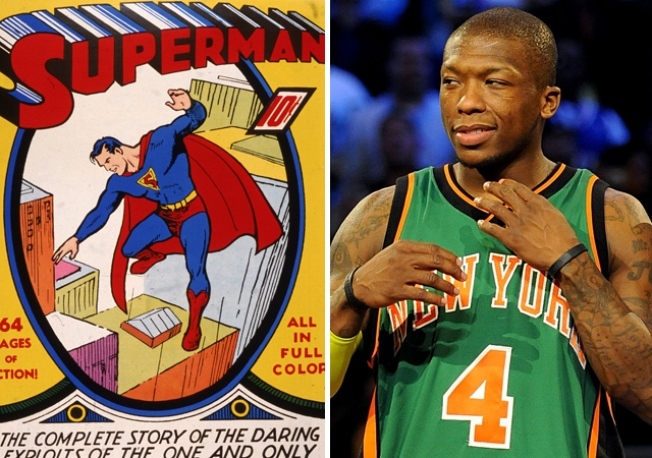 The NBA planned to start selling green Knicks t-shirts with Nate Robinson's number four. Instead of Robinson over the four on the back, though, they were going to write Krypto-Nate to commemorate his dunk over "Superman" Dwight Howard. DC Comics, which publishes Superman comics, objected to the idea/wanted their share of the profits, however, and the shirts were sent to the Fortress of Solitude for the time being. Instead, the NBA and DC are trying to come up with a way to join forces in a Justice League of their own. "The NBA decided not to release the Krypto-Nate T-shirt because of future initiatives we are working on with Warner/DC Comics," an NBA source told The New York Post. Here's a couple of ideas for new comics that would be big hits. Mike D'Antoni is a mild-mannered basketball coach by day, but by night he is the Magnificent Moustache, who uses his cosmically powered facial fuzz to fight crime in seven seconds or less! By virtue of strange radiation during a flight from Seattle to New York, Jerome James becomes The Sloth, a villain who robs banks by slowing the entire world down to his pace and then, in brief spurts, exerting himself!